This weeks image was captured during 2007 in China’s commercial and financial capital of Shanghai. 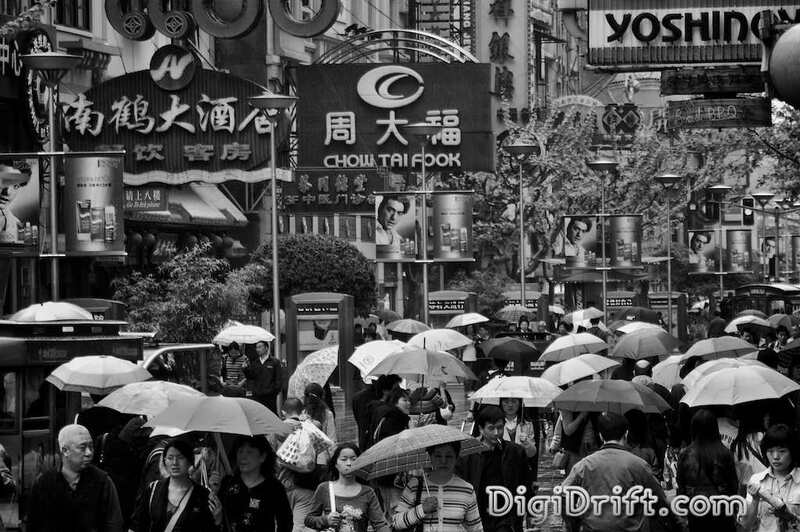 The image shows the pedestrian shopping mall of Nanjing Road, during a passing rain shower. In the blink of an eye, there’s an umbrella salesman on every corner, making a quick yuan on the sale of their goods. I didn’t mind the Nanjing Road district, but the other non discrete shopping centers I could do without. If the requirement of obtaining super power status is measured by the total space allotted to a countries shopping malls, then China is no longer emerging and has already arrived. Shanghai has a vast number of shopping malls, and Beijing has three of the top tens worlds largest (with the worlds largest being the South China Mall built in 2005 in Dongguan China has over 1500 individual shops). It appears that many of the countries historic buildings are making way for these monstrosities. China is changing rapidly, into what I’m not quite sure yet? Great picture. For some reason it looks like it was taken back in the 1920s or a long long time ago. Thanks for that praise. Sometimes I like to portray my black and whites images in that way, and it appears to have worked. Glad you interpreted the image that way. Man, I remember this place. The end of my overland journey. Have to agree with about this place. Lot’s of concrete buildings etc. Somehow I had romanticized it into old buildings mixed with new. Instead I saw something akin to this scene. Lot’s of people, subway, and bright flashing lights! Hey Dave, Yeah it was a little bit of a street disco scene, with neon flashing lights and advertising. There were clusters of buildings along ‘The Bund’ that had well maintained and renovated colonial architecture, and I did enjoy walking along that area at night. Who knows where Shanghai is heading in the short term future, but with all that was going happening on the other side of the river, I definitely know she’s not going to sit still. Thanks for your comment. Take subway to Shanghai Railway Station, then transfer taxi to get there. Subway fare 4RMB/person, taxi fare approximately 12RMB. It’s one of the most famous Buddhist temples downtown. Admission fee: 10RMB/person for outer temple. I would have loved to have seen this in color! China is all about the color!!! Hey Andi, I know you like your color. I’ve seen photo’s of your luggage. Nice composition on this shot. I like the choice of Black and White because the monotony of colour adds to the business of the scene. Hey Brendan, Thanks for the praise, I appreciate it. I reckon you and I are on the same wavelength when it comes to the decision of when an image will tend to lend itself to a black and white print. With the amount of distraction in the scene when portrayed in color, I feel is to much. In black and white I feel there is a nice balance across the image. Thanks for stopping by. I like it in Black and white as well. color would been too busy knowing them Chinese street signs!! Hey Natalie, Yeah I’m hearing you. Those neon street signs can be a bit to full on, but make for good images all the same. Thanks for stopping by. In New Caledonia a couple years ago, we were out cruising for a secluded beach spot for lunch. I noticed an old stone building in a farmers field and It was just begging of me to climb the barbed wire fence, and take it’s photo.